Bourgoin have sacked director of rugby Philippe Saint-Andre for applying to become the next Wales coach. "Philippe Saint-Andre is not Bourgoin's manager any more," club chairman Pierre Martinet said on Sunday. "To read that he was in touch with the Welsh Rugby Union was the straw that broke the camel's back. He should have told me about it and he didn't." 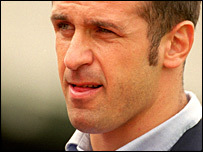 The former France skipper coached English side Gloucester for three seasons before leaving for Bourgoin. Saint-Andre, 36, played 69 times for France between 1990 and 1997, 34 times as captain. He admitted on Friday that he was one of the candidates to replace Steve Hansen when the New Zealander steps down as Wales coach after this year's RBS Six Nations Championship. "It would be an honour to coach a national team such as Wales," Saint-Andre said on Friday. "I can confirm that we were contacted by an agent who told us that the WRU could be interested in myself and Laurent Seigne." The agent, Peter Underhill, confirmed that Saint-Andre had applied: "I have submitted CVs on their behalf to the Welsh Rugby Union." Saint-Andre wanted to bring right-hand man Seigne, a former international prop, with him if he was offered the Wales job, after a successful partnership at Gloucester and Bourgoin. Seigne is still currently coaching Bourgoin and Martinet said he wanted him to stay on.